A wood-fired bakery, warm mulled cider and a cooking school delivered by Gourmet Farmer’s Matthew Evans. 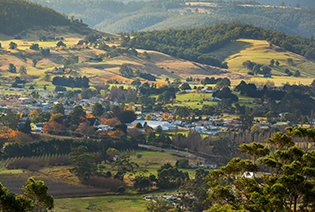 What’s not to love about a day spent exploring the Huon Valley? Once you’ve settled into Lenna of Hobart a heritage hotel in Battery Point and one of the leading hotels in Hobart, it’s time to discover Tasmania’s south. We suggest a trip to the Huon as a winter must. Plan your trip to coincide with the Huon Mid-Winter Festival, happening July 14-16. It’s likely the only time you’ll ever sing to apple trees. This pagan ritual known as ‘wassailing’ at Willie Smith’s Apple Shed apparently scares evil spirits out of the orchard, ensuring a bumper crop of apples. If dressing in odd garb and banging pots and pans isn’t your thing, there’s plenty of mulled cider, live tunes and fireside eats throughout the festival. Gourmet Farmer’s Matthew Evans also invites you to spend time in his home valley. Not far from Cygnet, the TV identity and Tasmanian convert runs Fat Pig Farm. A day spent at his cookery school begins with meeting the pigs in provided gumboots, gathering fresh farm produce and returning for hands-on learning with Matthew. Then, around a big long table, a celebratory feast is enjoyed by all. The winter focus is comfort food – think hearty soups, chunky pies and beautiful braises. There’s plenty of other stops that make a day down the Huon a rewarding drive. In less than 30 minutes from the CBD, the likes of Home Hill Winery, Willie Smith’s Apple Shed or even a delicious burger at the Ranelagh General Store await. Continue on down to Cygnet, and you’ll understand why many ‘mainlanders’ have migrated to this tiny scenic township. In Cygnet, be sure to stop in at the Cygnet Woodfired Bakehouse. This is where you’ll find deliciously flaky croissants, pies and treats pulled straight from the wood oven. It’s an ‘unplugged’ experience unique to the town. There’s also Franklin Bar, a great place to stop in and sample Franks Cider as well as the nearby Wooden Boat Centre. Further still, you’ll find some of Australia’s best sushi in Geeveston. Just ask any local where to find Masaaki. If he’s not out surfing, he’ll be only too happy to serve you.